The sun moves along the plane of the ecliptic over the course of the year, crossing through 13 constellations — 12 of which are the "classical" Zodiac. Sometimes, when there is a slow news day, I think the mainstream media likes to recycle a story that previously caused some controversy in order to "stir the pot" again and get another rise from the general public. That certainly seemed to be case about a month ago, when a news story began furiously circulating about how NASA had just changed the signs of the Zodiac. That first line about how "NASA updated astrological signs for the first time since Babylonians devised them some 3,000 years ago" almost made me spit out my morning cup of tea. And sure enough, this "cosmic revelation" went viral. By that same evening, virtually every TV news broadcast devoted a few minutes to how the astrological signs had suddenly been changed. If they only did their research . . . I guess the news media contracted amnesia that day — or at the very least has a very short memory. More likely it was simply a case of not doing some simple research. It was less than six years ago that the flames of this so-called controversy were fanned. And back then, NASA had nothing to with it. In January 2011, a newspaper in Minneapolis innocuously reported that a naturally occurring wobble in the direction of the Earth's axis — known to astronomers as "precession" — had altered the alignment of the star positions from their "traditional" zodiacal signs. Like the so-called "NASA announcement" last month, the 2011 report citing Parke Kunkle, a board member of the Minnesota Planetarium Society, quickly went viral. But ironically, the "revelation" that Mr. Kunkle had uncovered was nothing new at all. Indeed, it has long been known that any given "sign" assigned to particular calendar dates in your daily newspaper's horoscope is not where the sun actually is that particular month, but where it would have been thousands of years ago! Yet today's astrologers, who believe that the sun, moon and planets mysteriously direct our lives, continue to adhere to star positions that for all intents and purposes are out of date by thousands of years! And at the time I threw in my two cents in an interview about all this on Space.com's sister site, Live Science. Of the imaginary coordinate lines that astronomers and navigators use in mapping the sky, perhaps the most important one is the ecliptic, the path the sun appears to take through the sky. Because of Earth's yearly revolution around the sun, the sun appears to take an annual journey through the heavens with the ecliptic as its path. Technically, then, the ecliptic represents the extension or projection of the plane of Earth's orbit out toward the sky. But since the moon and planets also move in orbits, whose planes do not differ greatly from that of Earth's orbit, these bodies always stay relatively close to the ecliptic line when they're visible in the sky. In other words, our solar system can be best-defined as being somewhat flat, with all eight planets moving in very nearly the same plane. The Zodiac consists of the 12 constellations through which the ecliptic passes. The name is derived from Greek, meaning "animal circle," which is also related to the word "zoo" and comes from the fact that most of these constellations are named for animals, such as Leo, the Lion, Taurus, the Bull and Cancer, the Crab. 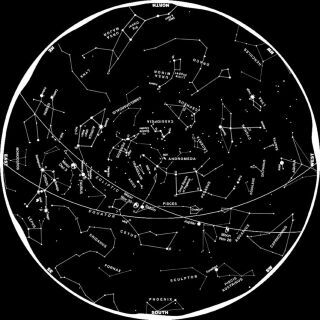 Those names, which can be readily identified on sky charts, are familiar to millions of horoscope users (who — ironically — would be hard-pressed to find them in the actual sky). If we could see the stars in the daytime, we would see the sun slowly wander from one constellation of the Zodiac to the next, making one complete circle around the sky in one year. Ancient astrologers were able to figure out where the sun was on the Zodiac by noting where the last constellation to rise ahead of the sun was (at dawn), or the first to set after it (at dusk). Obviously, the sun had to be somewhere in between. As such, each month a specific constellation was conferred the title of "House of the Sun," and in this manner each month-long period of the year was given its "sign of the Zodiac." Who is this serpent guy? One of the things that really rankled horoscope readers about the readjustment was the insertion of a 13th zodiacal sign. Although the ecliptic passes through the constellation of Ophiuchus (ŏf-i-ū-kus), the Serpent Holder, that constellation is not included among the 12 classical signs of the Zodiac. In fact, the sun spends more time traversing through Ophiuchus than nearby Scorpius (called "Scorpio" by the astrologers)! It officially resides in Scorpius for less than a week: from Nov. 23 through 29. It then moves into Ophiuchus on Nov. 30 and remains within its boundaries for more than two weeks — until Dec. 17. Yet the Serpent Holder was not considered a member of the Zodiac, and so deferred to the brighter and more prominent constellation of Scorpius! Why 12 zodiacal signs instead of thirteen? Well, each zodiac sign is 30 degrees wide. So 12 x 30 = 360 degrees, making a perfect circle around the sky. But 360 divided by 13 would make each zodiacal sign 27.6923-degrees wide. In addition, because the moon and planets are often positioned either just to the north or south of the ecliptic, it allows them to sometimes appear within the boundaries of several other nonzodiacal star patterns. For instance, the planet Venus will briefly clip a corner of the nonzodiacal constellation Cetus, the Whale, on May 9-10, 2017. And on July 29-31, 2017, Venus will be located inside Orion's upraised club. And no, Orion is not a card-carrying member of the zodiac either. In his book "More Mathematical Astronomy Morsels" (Willmann-Bell, Inc. 2002), the renowned astronomical calculator Jean Meeus points out that there should actually be 22 (count 'em!) zodiacal constellations, reflecting all the constellations the moon and some of the planets from Mercury to Neptune can occasionally enter. In addition to the 12 classical zodiacal signs and Ophiuchus, we can also add the following: Auriga, the Charioteer, Cetus, the Whale, Corvus, the Crow, Crater, the Cup, Hydra, the Water Snake, Orion, the Hunter, Pegasus, the Flying Horse, Scutum, the Shield, and Sextans, the Sextant. Joe Rao serves as an instructor and guest lecturer at New York's Hayden Planetarium. He writes about astronomy for Natural History magazine, the Farmer's Almanac and other publications, and he is also an on-camera meteorologist for News 12 Westchester, New York. Follow us @Spacedotcom, Facebook and Google+. Original article on Space.com.